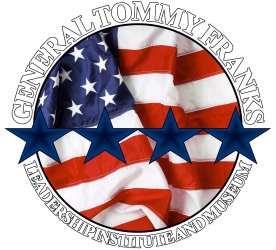 The General Tommy Franks Leadership Institute and Museum offers three buildings in which private individuals, companies, clubs or corporations may hold events. To book your event, please call (580) 726-5900. The Styron Library is dedicated to Major General James Clyde Styron. He entered the United States Military Academy (West Point) and graduated with the class of 1918, which graduated early to join the effort in the Great War (World War I). He was commissioned Second Lieutenant in Coast Artillery with date of rank November 1, 1918. During World War II, he participated in the Sicily (1943) and Italian (1943) Campaigns and took part in the Anzio Beach head (1944). On October 30, 1946 he was promoted to the rank of Major General. He assumed command of the 45th Division and reorganized the Guard. In June 1950 South Korea was invaded by North Korea. This action led to the second federal mobilization of the 45th Infantry Division. Major General Styron commanded the Thunderbirds, who were one of only two National Guard divisions to see combat in the Korean War. Originally built in 1929 and opened as Stanley’s Furniture, the newly remodeled Stanley Building is the perfect venue for your next large meeting or event. This beautiful, historic two-story meeting facility has the versatility to accommodate a large variety of banquets, meetings and events. The historic Creamery Building that once lined the Rock Island railroad tracks has been beautifully remodeled to accommodate small meetings and events.